Roger Federer is to make an earlier than expected return from knee surgery at the Miami Open in Key Biscayne next week. The 17-time Grand Slam champion had arthroscopic surgery on February 3 to repair a meniscus he tore the day after his Australian Open semifinal defeat to Novak Djokovic. He skipped tournaments at Rotterdam, Dubai, and Indian Wells. He had hinted he would return to the tour at the Monte Carlo tournament in April. But he decided to get back to action in Key Biscayne. Federer posted an emoji-filled Tweet on Thursday morning that included an airplane, American flag, orange, sun, palm tree, dolphin, beach, sunglasses, tennis ball, thumbs up and @MiamiOpen. His agent, Tony Godsick, confirmed that Federer is headed to South Florida and plans to play the tournament, which runs March 23 through April 3. 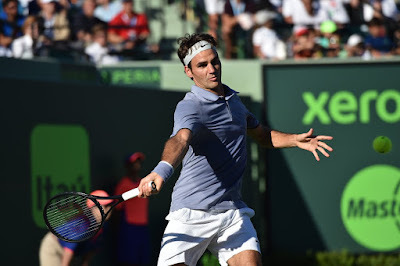 Federer skipped Miami in 2013 and 2015, but played here in 2014.